I left a little early for school, travelling solo this week since Tod was swamped with a translation project, and arrived early enough to watch the entire pre-study ritual. Of course, my presence with a camera was hugely distracting. A discreet ethnographer I’m not! But I made every effort to be unobtrusive as I shot some footage showing what a typical country school morning looks like. 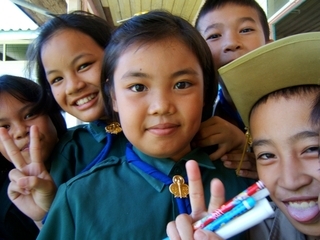 Wednesdays are scouting day so everyone is in their Boy Scout and Girl Scout uniforms. The pre-class ritual is mostly student-led with the older students taking turns preparing for and then running individual sections. We begin with the raising of the flag and the singing of the national anthem. This is followed by prayers for the Monarchy, the Kingdom, and the People. 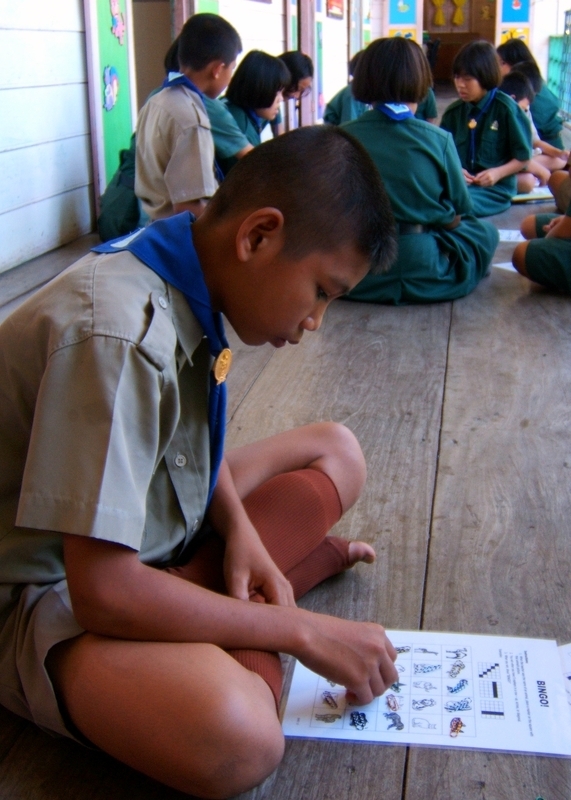 Everyone is then seated to listed to a brief lesson, delivered by one of the older students, on Thai values, manners, or customs. This is where restlessness sets in. Left: Pre-schoolers wearing their school-specific smocks, making clean-up easier! The principal or another teacher then makes announcements and admonishes the students about whatever recent behavior is worthy of a lecture. In this case it was students failing to exhibit proper politeness to their English teacher (me). More on that later. 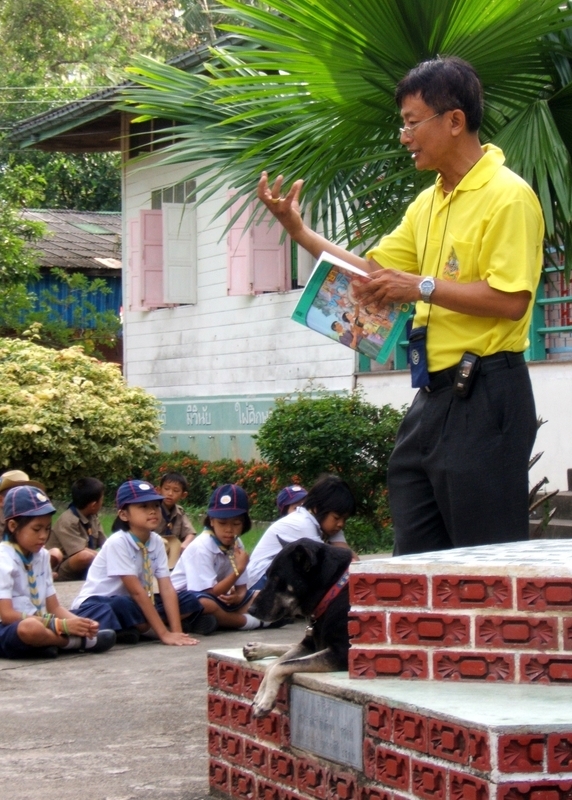 Right: Khruu Somchai lectures the children. 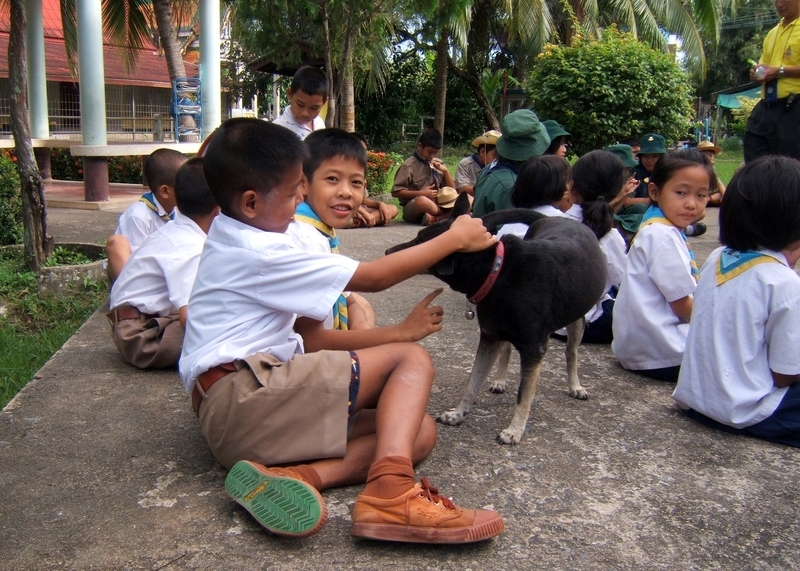 Left: Bored and restless, one of the school’s mascots walks through for some attention. Finally, it is time to stand again for a little exercise. 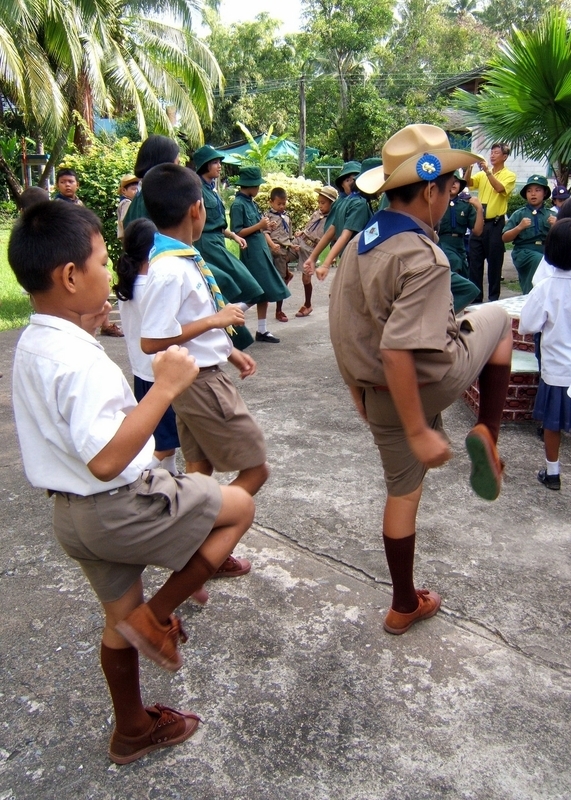 There is a routine of movements, based on Thai kickboxing, that all the students go through more or less in unison. Right: Kickboxing as part of the morning exercise ritual. Having burnt off a little energy, the youngest students – pre-school age – go to their classroom and the students in the first through six grades go to the porch area to sit and do some Buddhist chanting. I’m not clear how any Muslim students would be handled. Presumably they would be allowed not to participate. As that concludes, having taken about thirty minutes, there is still a half-hour or so before classes begin. Students have various chores and tasks they are assigned around the school: they work in pairs or small groups to sweep, clean, and tidy up.There is a certain “pride in ownership” because this is their school, in their community. In some cases, literally next to their homes. Left: Chris and the four teachers. The Ajarn Yai (Principal) is away at conferences. As the 75-year old school house in Bangkhonthii undergoes updating for its electrical wiring, including the replacement of all the antiquated light fixtures with modern industrial flourescent ones, the faa (electricity) had to be disconnected at the main line down by the khlong. This meant that the fans in the classroom were not working for almost the entire day. Despite the favourable design of the classrooms – a design that promotes effective natural cross-ventilation – the weather today was very hot and mostly still. With the heat and still air, the mood for learning was dampened. Especially when I was trying to teach the younger children the vocabulary for the family. In Thai, brothers and sisters (actually, all people, not just family) are distinguished by an additional word to distinguish their position relative to you: Pi for those older and Nong for those younger. Trying to explain that in English we merely say “brother” or “sister” and don’t add a prefix for older or younger, was causing confusion. So we moved to the porch and played bingo, while calling out vocabularly (this is body part bingo, following on the heels of the wildly successful animal bingo and fruit bingo) and fanning the children a laminated bingo card. Left and Right: Bingo on the porch. About thirty minutes before the end of class, power was restored and we turned the fans on. Just in time to assign gaanbaan – homework! As for the lack of politeness Khruu Somchai was lecturing the students about, Thai society is highly hierarchical as well as highly suphaap – polite. 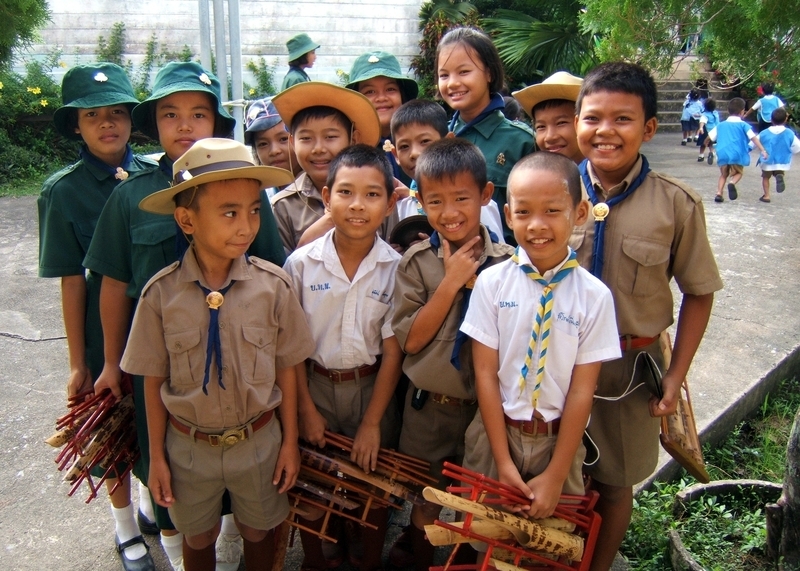 Students wai – the prayer-like greeting with hands folded to the chest or low face and the head bowed slightly – teachers when they walk past and are also to ask permission to enter and exit the classroom. And of course, a Thai student would never call a teacher by only his name, but always with the honorific Khruu (teacher) beforehand. Last week, Tod confirmed an observation I had made that students were sometimes a bit familiar, just referring to us by our names instead of with the honorific. For me, it doesn’t make much of a difference, especially since in English we don’t normally refer to our teachers as “Teacher So-and-so.” At the same time, we do refer to them in English as Mister or Missus followed by their last name. In Thai, people are referred to by their first name, so Khruu Somchai’s first name is Somchai. Leaving off the honorific results in a tremendous amount of over-familiarity. As I said, it doesn’t particularly matter to me, but the grease that lubricates the wheels of Thai society is the ritualized good manners, so I need to help reinforce it if for no other reason than to respect the norms of the cultural which I teach and the children and I both live. So from now on, Khruu Chris it is. The pre-school and kindergarten aged children have been terrified of me for weeks, not daring to approach too close to this farang. After five weeks teaching, they have become more brave, Liliputians daring to confront the giant. Their older brothers or sisters started bringing them up to me before class today to introduce them. The little ones would wai and then stick out their hands to shake – this Western style of greeting seems to carry a cache of cool especially among my youngest students, who all insist on shaking my hand on the way out of the classroom; I feel like a politician casting about for votes from the Barney set with all the hand-shaking! During lunch, several of the pre-schoolers were playing with the instruments, especially enjoying banging on the drum. So I went to see what was happening and they all came over as soon as they saw my camera, hams that they are. Rod – thank you for the very nice remarks. I feel really blessed to have the opportunity to volunteer like this. And I’m very lucky to have a partner who supports me putting 200 km on the car once a week and an employer – IKON Office Solutions – that has allowed me the working flexibility to do this. Seeing the children outside of Bangkok really provides another perspective on Thai life; Bangkok is great but it isn’t Thailand, just a facet of Thailand. If you have the opportunity to come visit, I’d be happy to take you down to Samuta Songkhram on a Wednesday. We can always use another native English speaker!